I think the very best thing that can be added to Space Engine that can start very simple and shouldn't (in theory) be a huge project, would be simple base building. Something that can be expanded on and even handed largely over to a modding community. It would give us something to do with all the planets and stars! Other things involve so many intermingling concepts and projects and so much time, whereas a simple base/colony building and sharing mechanic would provide immediate stuff to do, immediate fun and would fit right in with the whole idea of Space Engine. Don't get me wrong, I have a HUGE wish list and this isn't even at the top of my wish list, but when thinking what this one-man project could do to add some gameplay quickly, this is the first thing that comes to mind. I think the very best thing that can be added to Space Engine that can start very simple and shouldn't (in theory) be a huge project, would be simple base building. With the next update supporting stations with fixed orbits it shouldn't be too difficult to make buildings and give them a fixed orbit on the surface, but actual base building like Salvo said, would require quite a bit more work to implement. It depends on how the orbits are implemented, as a point on the surface doesn't follow a path that would be valid as an orbit. And fair enough, I didn't understand those limitations. The camera is able to have collision with the surface, but I assume that is not enough telemetry for having buildings lock on to the surface? Source of the post It depends on how the orbits are implemented, as a point on the surface doesn't follow a path that would be valid as an orbit. Just set a geostationary orbit and have it on the surface, it is possible in 0.9.8.1 with fixed model orbits being supported. Kinda pedantic. If you change the inclination then match the rotation you could shrink the orbital radius down to the surface and get the station locked onto those coordinates, then it would never move. Not trying to be pedantic, as far as I can tell it won't work. Maybe I'm being dumb. If you change the inclination away from the equator in a geosynchronous orbit, how does the satellite remain at a fixed position above the surface? Source of the post how does the satellite remain at a fixed position above the surface? Match it's orbital velocity to the rotation rate below it at the point you want it to sit and then reduce the orbital distance down to ground level. I think we might be confusing geostationary with geosynchronous. They're similar, but not the same. An orbit which is fixed to a point on the surface (geostationary), such that it appears stationary in the sky, only works along the equator. Otherwise the the best you can do with an inclined orbit is make it geosynchronous, which returns to the same point relative to the surface with each orbital period. A circular geosynchronous orbit will appear to oscillate north-south in the sky -- the greater the inclination the greater the oscillation. If it is not circular, then it will trace a more complex shape (an analemma). All geostationary orbits are geosynchronous, but only circular equatorial geosynchronous orbits are geostationary. 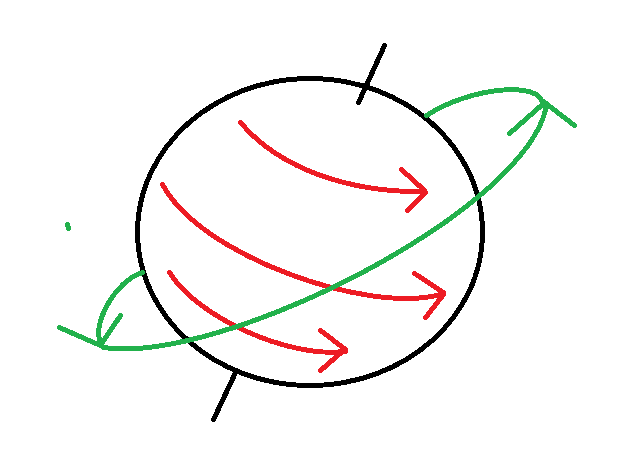 The qualifying property of a geosynchronous orbit is that its orbital period matches the rotation period, so it must have a specific semi-major axis. Beyond that you can give it any eccentricity and inclination that you want. Watsisname, I am starting to think there is some miscommunication going on here. The entire point I am making is not about term use or anything to do with real world orbits, but that SE does not limit these things so you could match the rotational speed with the orbital velocity of the craft and then just reduce the orbital distance to the surface and put that in the catalog script. For all intents and purposes it would make your station into a fixed object on the surface. That could be, and if so I'm sorry. But like Kali I still don't understand why this method would work in SE, and I was using the terminology to try to explain why. What I'm imagining is that if you tried this, your path would not actually remain at the point that you wanted, but instead drift north or south of it. Not because of orbital mechanics, but because of geometry. Basically the problem is that lines of latitude (except for the equator) are not straight. If you want to follow one then you must constantly turn. One way to see this to imagine drive a car eastward along +89.9th parallel. You would be driving in a small circle around the north pole, constantly holding the wheel to the left. If you let go of the wheel and drove straight, you would suddenly find yourself deviating to the south, and your path would eventually cross the equator and lead close to the south pole! The same concept will apply to flying an airplane or leaving a satellite in orbit. If you give yourself some velocity eastward to match the rotation of the planet, your heading will start to drift and you'll move away from the point that you wanted, unless you start at the equator. The only way not to drift is to constantly turn. Source of the post your path would not actually remain at the point that you wanted, but instead drift north or south of it. This is probably true, which is why I originally said equatorial orbit is best as that makes matching the rotational speed much easier.